One of the most consecrated destinations in India, Gujarat is the land of Lord Krishna. This sacred place abodes oodles of holy temples that allow the devotees to get drenched in the spirituality in the midst of utter serenity. The sacredness of this place can be traced from the times of Mahabharata. This 04 Nights and 05 Days itinerary take the tourists to a comprehensive and pleasant tour to most famous temples of Gujarat. The destinations included in this itinerary are Rajkot, Dwaraka, Porbandar, Veraval and Somnath. Some of the major highlights of the trip are visiting Dwarakadhish Temple, Kirti Mandir- the home of Mahatma Gandhi in Porbandar and visiting the Somnath Temple, which is among the twelve most holy shrines- Jyotirlinga, dedicated to Lord Shiva. The tour is perfect for the tourists who are spiritual at heart and want to unravel the peacefulness of Gujarat. On arrival at the Rajkot airport in the morning, meet our representative who will take you to Dwaraka. In the evening, you will arrive in Dwaraka and check in at your already booked hotel. Later, we will leave to visit the temple and take part in the evening Aarti. An overnight stay in the hotel. In the morning after breakfast, we will visit the Dwarkadhish temple. 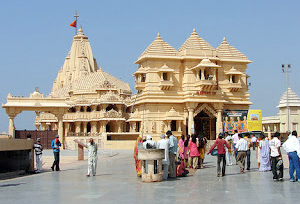 After visiting the temple, we will drive to Porbandar. 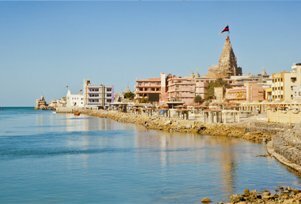 Porbandar is a picturesque old sea port situated on the western coast of Gujarat. It was the birth place of Mahatma Gandhi. Enjoy an overnight stay in the hotel in Porbander. After breakfast in the morning, we will visit the Kirti Mandir or the Gandhi home in Porbandar. In this the Mahatma Gandhi, the father of the nation was born in 1869. There are 17 rooms and three storeys in this house. After visiting the Porbandar, we will drive to Veraval and have an overnight stay in the hotel. In the morning, we will drive further to visit the legendary shore temple of Somnath. This temple is one of the twelve most sacred shrines dedicated to the Lord Shiva and a Jyotirlinga. Later, return back to the hotel in Somnath for an overnight stay. Today, we will drive to the Rajkot airport to board the flight for the onwards journey.